This surface plot displays the results of a statewide mixed methods policy study of substance abuse prevention need. Qualitative focus group and interview data were coded to determine the extent to which community members indicated they lived in a community that holds attitudes that perpetuate substance abuse. Higher scores indicate the community reported attitudes that perpetuate the problem. 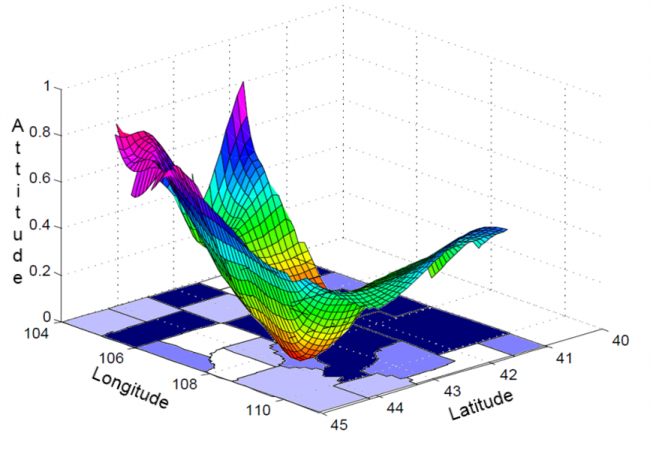 These data are presented in the rainbow-colored, contoured grid. Quantitative data appear in the Wyoming state map. Counties that are shaded in darker colors scored higher on our drug problem severity index, which was comprised of the following social indicator data: drug-related arrests, drug-related hospital discharges, and Hepatitis C cases. The findings suggest that social indicators may not be the best predictors of need in rural counties.